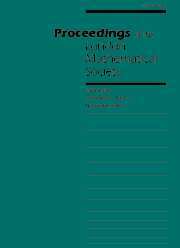 An eminent international mathematics journal, the Proceedings of the London Mathematical Society has been published since 1865. In 2005, the London Mathematical Society is pleased to announce, the introduction of an open access policy, in which the most recent two issues will be freely available online as part of a one year experiment. Papers from the Proceedings, cover a wide range of mathematical topics that include real and complex analysis, differential equations and related areas, topology, geometry, logic, probability, statistics, algebra, number theory and combinatorial theory.